New composition: The water conditioner sera aquatan now does not require any colorants and contains important mineral substances. It immediately removes up to 1.5 mg/l nitrite per dosage and acts preventively. The new sera Nature food types do not require dyes nor preservatives and thus allow for a special natural fish diet. 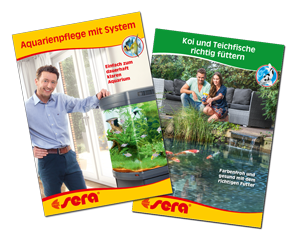 sera is presenting three highly effective treatments for ornamental fish, which are produced on a herbal basis, in the sera Phyto med range. Flexible hoses with different sizes and accessories such as connectors, non-kink protection, holder or branch ducts. The new high performance filter medium sera crystal clear Professional removes smallest particles above 10 µm (such as floating algae or sludge) in shortest time. You can quickly and easily evaluate the water parameters of your aquarium in the sera online laboratory. We will give you advice on how to improve the water quality if required. sera is a medium sized company from North Rhine-Westphalia. The range of sera products covers a wide selection for aquariums, ponds and terrariums. Apart of the fish foods, treatments and filter media sera offers technical products and those for water care. As manufacturer of more than 2000 articles for aquariums, ponds and terrariums sera has everything for species specific care and pet keeping demands. Ornamental fish, shrimps and reptiles but also aquatic plants can be kept successfully with sera products. Keeping aquariums, ponds or terrariums is a highly diverse and interesting hobby. sera’s main philosophy is to keep things non complicated allowing users to concentrate on the side of enjoyment pet keeping has to offer. Every hobby has its challenge but also problems here and there. Clever solutions are sought for such situations. The sera research team has developed a lot of such solutions during the last decades: Starting from species specific foods, shrimp foods, foods for reptiles to water conditioners reducing the stress impacts in aquatic inhabitants during the procedure of water changes. Highly efficient treatments help rapidly against infections; unique filtration media siporax generates superb water parameters. The company sera has its headquarter in Heinsberg/North Rhine-Westphalia. This position in central Europe offers logistic advantages and as consequence advantages for the environment, too. sera has several own branches and partners for distribution. Through them sera products from Germany are available in 80 countries worldwide.